At the beginning of my Whole30, the thing I probably missed the most was cheese. So when I stumbled upon Nom Nom Paleo’s recipe for macadamia nut “ricotta” I was pretty excited. It is a cinch to make in the food processor and requires less than five ingredients. During the Whole30, I used it to make these devils on horseback and also as part of the filling for stuffed peppers. Both were delicious applications for this faux ricotta. One welcome side effect of the Whole30 is that we started a love affair with dried fruit, especially dates. Since dried fruit has quite a bit of sugar and consequently, calories, we eat the fruit sparingly for the most part. It is an after dinner treat or a way to celebrate the end of the work week; an unexpected benefit is that my children have also discovered their love of dried fruit and ask for it for dessert, which is pretty awesome. Recently, I found myself with a dinner party to plan and I wanted to serve a dessert that felt decadent but was still Whole30 compliant. 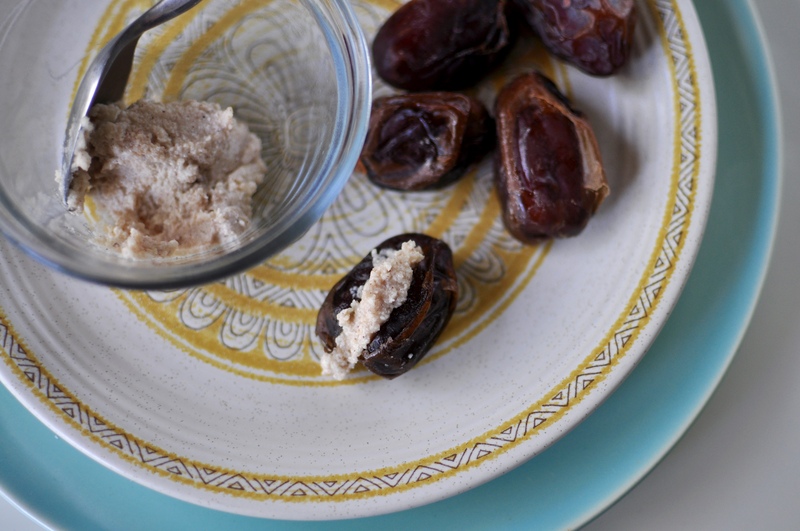 I had a brain wave and decide to stuff our household favorite, dates, with the macadamia nut “ricotta.” To make the flavor more complex, I added some aromatics that you typically find in Indian sweets – cardamom, rose water, and cinnamon. The dessert had all the exotic taste I actually enjoy in Indian desserts without the cloying sweetness that totally turns me off. And my guests loved it. I also added a touch of honey which you can leave out if you are doing a Whole30. Ingredient notes: You will make more macadamia nut ricotta than you need for this recipe. Use the remainder to top meatballs, or to stuff peppers. Rose water can be found in Indian markets or online. As the name suggests it has an incredible floral quality and a little goes a long way! An easy no-cook dessert that will wow your guests with its complex flavor. These stuffed dates come together in less than 30 minutes but have a hauntingly delicious taste. 1/3 cup macadamia nut "ricotta"
In a food processor or a high powered blender, purée the ingredients together until smooth. If necessary, scrape down the sides with a spatula and/or add a bit more water. The resulting texture should resemble ricotta cheese. Mix together the honey and aromatics with 1/3 cup of macadamia nut "ricotta." Slit each date down one side and remove the seed. Using a small teaspoon, fill each date with about 1/2 - 1 tbl of the spiced faux ricotta filling. These dates can also be made in advance and will keep for several days in the fridge. But the filling will turn browner the longer they sit so for optimal appearance, serve immediately.